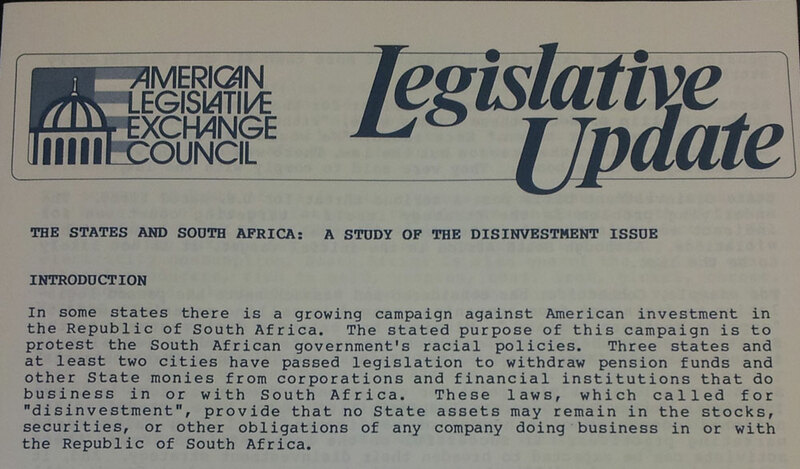 The conservative group ALEC, now in the news, also played a role in Nelson Mandela's struggles. There’s a lot of news this week on the American Legislative Exchange Council and the related network of state-based think tanks, the State Policy Network. Almost a year ago, when I was at a small upstart blog called Republic Report, we first sent a letter to corporations involved with ALEC, asking them to leave the organization, given its role in crafting the Stand Your Ground law in Florida. The Guardian unveiled a trove of documents revealing that ALEC has suffered tremendously from the negative press around those efforts, which involved a group of left-of-center organizations, including the Center for Media and Democracy and Color of Change. Many businesses actually did leave ALEC. While ALEC seems down, they’re not out. According to the documents obtained by The Guardian, ALEC and its allied organization, SPN, have redoubled their efforts to expand and find new funding streams. The documents suggest fundraising off of gambling efforts, efforts to push worker retirement accounts into dubious 401(k)-style plans, and other corporate giveaways that ALEC and SPN can spin into legislative templates and advocacy. Specific corporations and lobbying organizations are listed as prospective donors. The money just never stops. This is the inherent difference between right-leaning organizations and their counterparts on the left. Large corporations view their right-wing giving as a strong return on investment. For almost every major conservative issue campaign, at least on economic policy, the wealthy and powerful ultimately benefit, meaning their donations to groups like ALEC and their cohorts are well-served. If corporate donors give to the left, as they sometimes do, they risk higher taxes, more empowered workers and less influence over elections. So it should be no surprise the the vast majority of corporate wealth in politics flows to the right and far right. This pattern has repeated itself for many decades, though it has accelerated in recent years. During the course of my research on how the conservative movement rebuilt itself in the aftermath of the 2008 elections, I found myself digging through many historical files that show this dynamic repeating itself like an endless feedback loop. 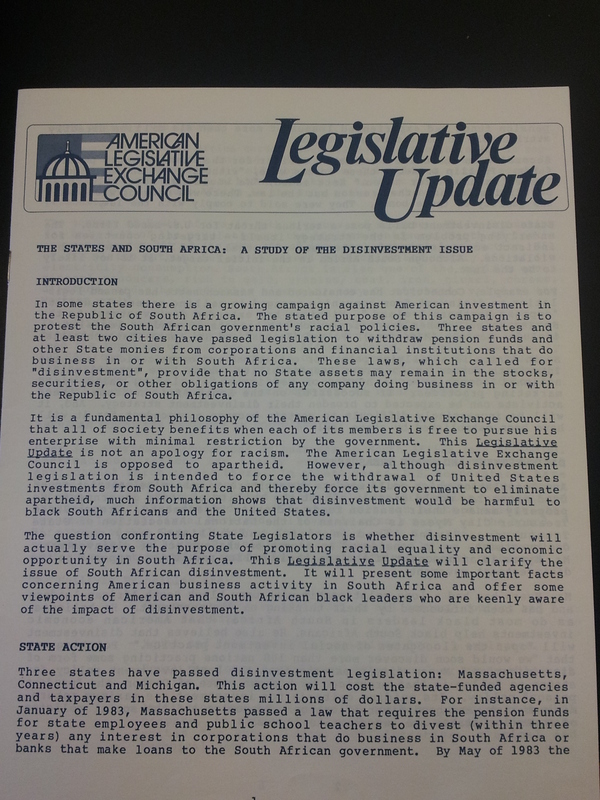 On the occasion of Nelson Mandela’s passing this week, it is worth remembering that many American conservative organizations opposed his struggle by fighting against sanctions and divestment from the apartheid regime that oppressed him. For ALEC, that meant partnering with corporations that faced calls for South African divestment and creating template legislation to block the pro-Mandela movement. For more on how the recent history of the conservative movement, including the role of ALEC and SPN, my book The Machine: A Field Guide the Resurgent Right delves much deeper. Also, The Nation has a thorough investigation of SPN/ALEC in the April 15 edition, which you can find here. Allison Kilkenny takes a closer look at the effects of Chicago school closures.